You may recall that when first announced, Heroes in Crisis was originally intended to be a seven issue series with a couple of stand-alone tie-in books. Plans changed, and those stand-alone issues were folded into the series. The first was issue #3, which focused in part on Booster Gold's actions just before the story started. The second, issue #6, comes out today. 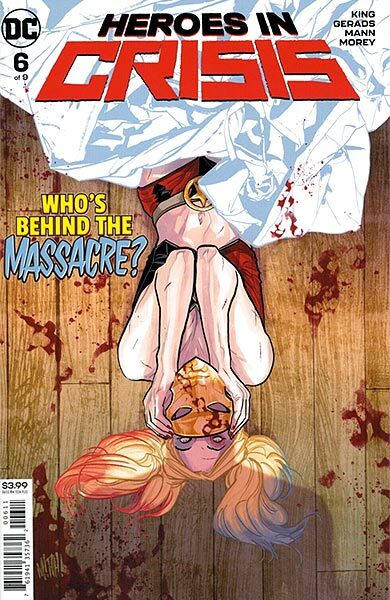 Judging the book by its cover, I think we can expect it to show what Harley Quinn was doing when the Sanctuary killings began. 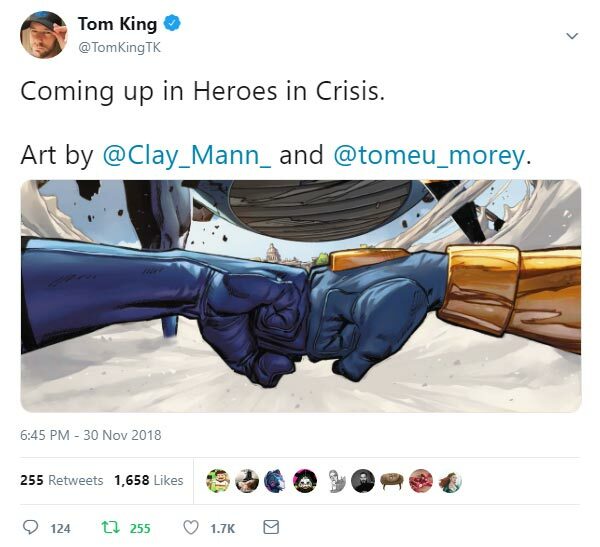 Note that Mitch Gerads is the credited artist for the issue, replacing Clay Mann. Mann's art has been the strength of the series so far, but Gerads shouldn't be considered a step down. Gerads worked with series writer Tom King to create their acclaimed Mister Miracle mini-series. Also note that neither the issue's solicitation text nor the preview, available on SuperheroHype.com, guarantee Booster Gold will actually appear in the issue. I'll be buying it anyway. We're less than a week away from Heroes in Crisis #6 of 9, which means we're pretty close to learning the truth behind who killed everyone at Sanctuary. 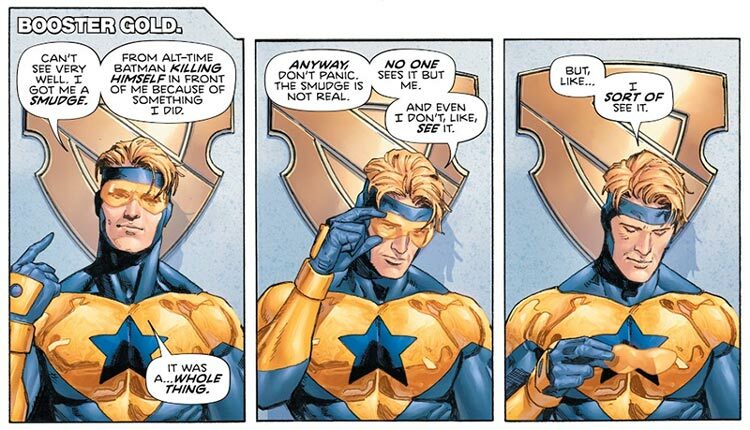 It seems like a good time to talk about Booster Gold's mental health. Clearly, Booster has been mentally struggling with fallout from his incredibly stupid actions in Batman #45. 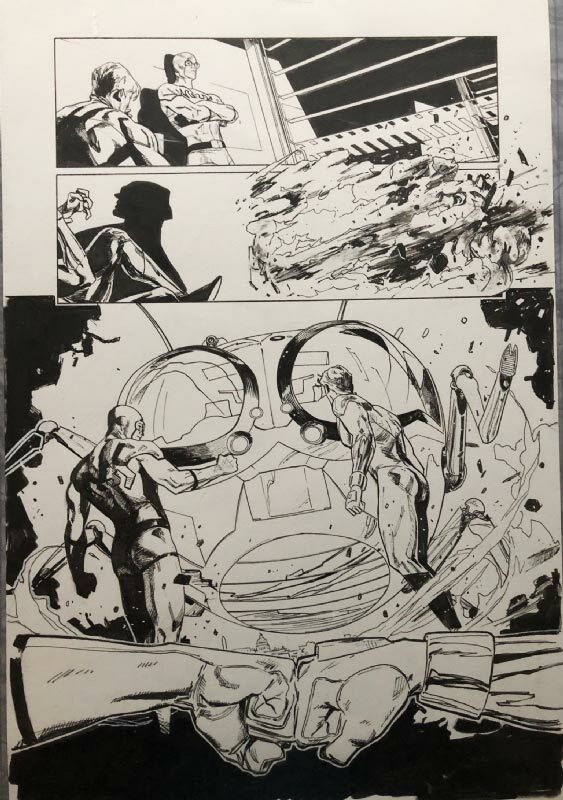 I had complained at the time that Booster's reaction to Green Lantern's graphic on-panel suicide was inappropriate — and it was — but I'm willing to concede that Tom King was trying to make a point in his own way about how the human brain reacts unpredictably to such trauma. And how is Booster Gold reacting to that trauma? 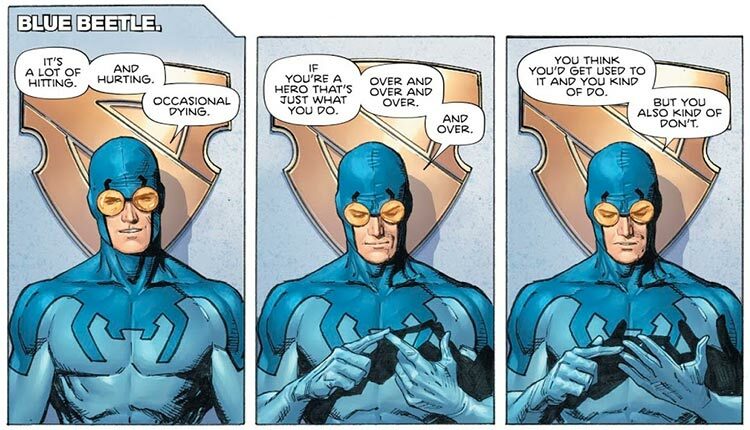 His symptoms as exhibited in Heroes in Crisis look like an aggravated case of Post Traumatic Stress Disorder, which is exactly what press reports advertised King wanted to address in this series. PTSD is triggered by extreme trauma with common symptom including avoidance of repeat stimuli, willful memory loss, and hallucinations. Booster has spent most of the series hiding from just about everyone, so check one. And he claimed he couldn't remember exactly what happened, so check two. But hallucinations? Maybe those too. 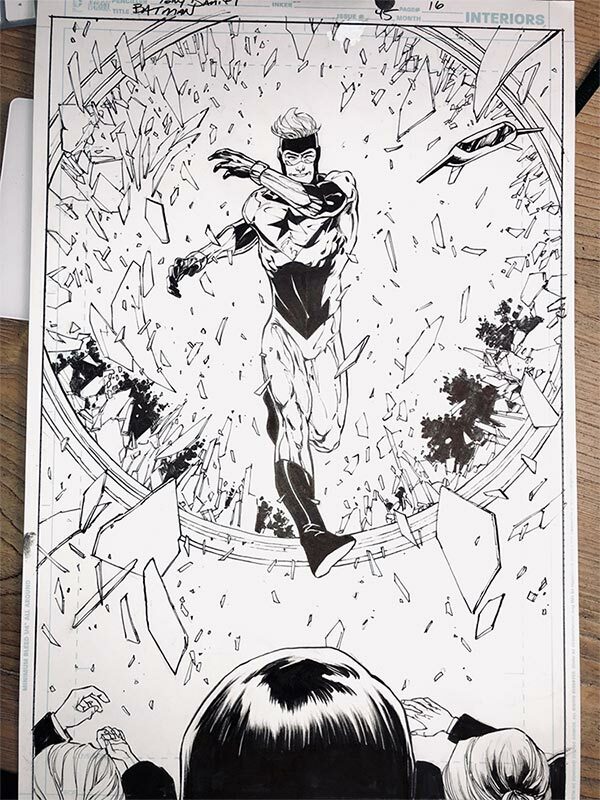 As Frankie Hagan pointed out in blog comments last month, so far in Heroes in Crisis, no one seems to have noticed Blue Beetle other than Booster Gold, which certainly suggests that the Blue and Gold reunion may be all in Booster's head. I don't know what that says about Booster Gold, but if it turns out to be true, it may be even more disappointing for Booster Gold fans than if our hero turns out to be a mass murderer. Speaking of murder, that's the real question, isn't it? Is Booster's mental illness severe enough to drive him to kill? Statistical evidence indicates that there are indeed links between PTSD and increased rates of outbursts of anger and violence. However, the odds that PTSD would unbalance a hero enough to engage in a spree killing remain remote. Experts say that the biggest indicator of how an individual may respond to PTSD is that person's pre-trauma personality. It's true that Booster Gold has always had his own set of foibles, yet he has never killed anyone, even when given the opportunity. At heart, he's no murderer, no matter what Tom King wants to imply. We'll find out more about Booster Gold's health when Heroes in Crisis #6 is released February 27. Yeah...if that's true, it's the last straw for me. Especially because Ted is ALIVE in the Rebirth continuity. There is no reason he should be a figment of Booster's imagination. And I don't see Booster being the one to kill. That would tarnish our poor hero even more. I don't think King would do that to Booster. I honestly enjoy a lot of Tom King's writing, but can admit its all pretty one note, dealing with trauma and mental illness. I just wish this series ends with a light at the end of the tunnel...and hopefully something comes out to undo all this senseless killing. But hey, at least the art has been good. I hope they dont make him the killer. That'd be a pretty low blow. Booster hallucinating Ted though is heartbreaking. I wouldn't be miffed, it actually makes sense he would fall back to a comfort zone. But sad nonetheless. And yes, while Ted was alive in BB rebirth series but continuity has been touch and go back and forth to Pre Flashpoint and not. Especially in Kings stuff. His Batman ans Catwoman even play with it on when they first met. 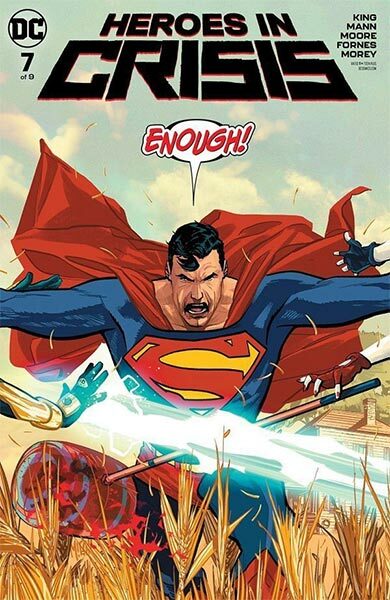 And the second variant cover did show Wondy snapping Lords neck. So anythings possible. I would love if DC would do a fun Booster Gold series. Something like Nick Spencer's Ant Man run would be so great. I've wondered for a while if Ted was a hallucination.... yes, due to the PTSD angle, but on top of that, who knows how much Booster remembers from pre-Flashpoint? If he remembers all of it, then he'd know his best friend died and how he couldn't save him on top of everything else, and even though Ted's alive now in this new continuity, maybe they're not as good friends (even if they are, it's gotta be awkward knowing what happened in Booster Gold 1-12.) As far as I know, we've never seen them interact. So, it would just be heartbreaking if it turned out that Booster was imagining the version of his best friend that he knew best, the one who died. And you're right, that would be sadder than finding out he's a killer. I don't think he killed anyone, but I know if they did that, he'd never be able to go back to his usual show-boating self. If you owned four Booster Gold comics and then bought five more, how many total comics do you have? If there were ten villains, and Booster Gold defeated ten of them, how many villains remain?